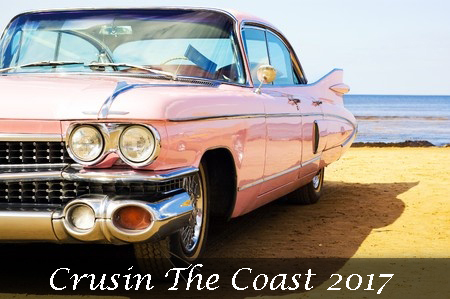 The Mississippi Gulf Coast will come alive October 1-8, 2017 with the sounds of classic cars, music, and good old-fashioned entertainment when the 21st Annual Cruisin’ The Coast kicks off. Known as America’s Largest Block Party, Cruisin’ The Coast has been going strong since 1996 celebrating all types of vehicles including antiques, hot rods, and everything in between. But the cars are only part of the fun. Cruisin’ The Coast also features live bands, ample parking and vendors for food and merchandise. In addition to all the festival fare that Crusin’ the Coast offers, it will also host a number of special events on different days throughout the week. On Tuesday, October 3rd, the event, “Salute To Our Veterans,” will be held from 10 a.m.-2 p.m. at Cruise Central. Also on Tuesday, October 3rd, a Flame-throwing competition will be held at the Island View Casino in Gulfport that will include $600 in Cash Prizes. On Thursday, October 5th, the Vicari Auto Auction will be held at the Gulf Coast Coliseum. Also on the ground of the Coliseum on Thursday, the Swap Meet and Manufacturers Midway will be held from 9 a.m.-5 p.m.
Cruisin’ The Coast has grown each year and is now the biggest festival event in Mississippi. Cruisin’ The Coast® has also begun to garner many awards through the years to go along with its growth. Cruisin’ The Coast won the coveted Governor’s Excellence in Tourism Award as Festival/Event of the Year, as well as the “Shining Example Award” for Best Festival/Event of the year by the Southeast Tourism Society.